There are a number of ways to do this project. I printed out three copies, two on a transparency and one on white paper. I cut out each of the fish, the rocks and the background out of the white paper and with a tiny amount of glue stick, I glued the front sides of the fish to the backs of each of the images on one set of the transparencies. 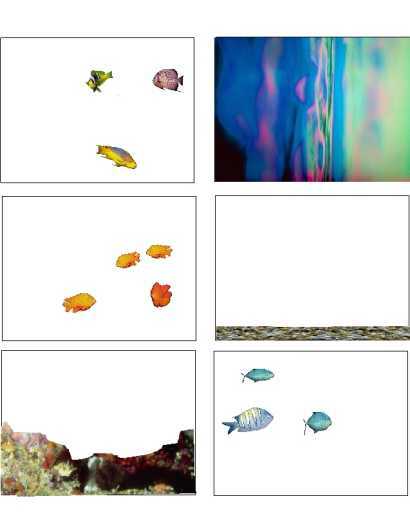 I then cut out each of the transparent rectangles and layered them- first the background, then the larger rocks, then each of the fish rectangles and then the thin rocks. It looks really good with a light behind it, or leave the background transparent. You can then tape them around the edges or space them out in a frame shape, to which you can add shells etc. The images can also be printed on white paper, cut out then glued to layers of rectangles of clear acetate or plastic. You can also add thin wavy strips of green tape, fiber or paper between the layers to look like seaweed, real tiny stones and your fish. Although some of the lines might be missing on some of the rectangles on your monitor, they will all print out. Hope you enjoy this printable. I have thought about this idea for a long time, it was fun to finally try it.